Two things you should know about us when it comes to storytelling. First, I love telling stories and I tend to go off on a lot of tangents... but I always get back to my point. How I manage to always circle back is quite bewildering to a lot of people. Secondly, we have rule in our house: if you start telling a story, you’re not allowed to back out. There are no never minds in this house. So, you're kind of stuck with me now! Since this is the beginning of our wedding story, I naturally wanted to start it at the beginning of us. The start of our relationship was a magical time for us, but it was also pretty stressful. The TLDR version of how we met is simply through friends, but there are a few details that are worth noting. The beginning sets the foundation of your relationship, and while those few details aren't ideal, they make up our story. When I met Mr. Narwhal in the summer of 2012, I was in the process of moving home to Muskoka after living in Ottawa for seven years. I had just been on a Europe trip (seven countries in three weeks) with one of my best friends (and bridesmaids) Click and was ready to move home for the best summer ever. BM Click was also moving home after being on exchange in Europe for law school. The plan for summer was sunshine, dock days and a lot of fun. Being from a small town, you generally know everyone your age. At one point or another in high school, you probably shared a class, or shared friends. Even if you're not friends, you're either an acquaintance or know of each other. Click and I had been best friends for 13 years (15 now! ); however, we always hung out with different circles. She went to a different university, whereas my other best friend L and I went to university together. One of Click's best friends and roomies from their university days together was around for one of the dock days that first weekend. We weren't close ourselves, but knew each other well enough through Click and other friends. Click always talked so highly of her friend’s boyfriend, who was away camping that weekend. I knew who he was, but had never really met him since he wasn't from our town. The next weekend Click's friends from law school were visiting. I had been in Ottawa earlier that week and had plans to go to a concert on the Friday night (City and Colour for the curious). When the tickets fell through I decided to go home early and party with Click and her visiting friends instead. On the Friday night, I briefly met her friends boyfriend in the mix. They were in an argument, and I vividly remember noticing how upset he was. The next morning we all were ready for a day in the sun on the dock. We went to the grocery store for snacks, and on the way we picked up her friends boyfriend (she was working). I had never really talked to him before and since I had just moved home and he was such great friends with Click we got to talking and really hit it off. I specifically asked him at one point, "How haven't we been friends? Let's be friends." And, an instant friendship was born. The two of us spent most of that Saturday together chatting, we just felt drawn to each other. We already felt like we had known each other for years. Later that night he told me about his doubts with his girlfriend and that things weren't going well, most notably, that she was moving overseas at the end of the summer. Somehow that night in the shuffle of all of the people Click, Mr. Narwhal and I ended up falling asleep in the same bed. Click in the middle of us, Mr. Narwhal on one side and me on the other. In the morning when I woke up I rolled over and saw that he was also awake. We locked eyes and smiled at each other, and I remember thinking to myself, "Uh oh." Before we all went home that Sunday morning Mr. Narwhal and I added each other to BBM (the good old Blackberry days). I texted L that afternoon and told her I was in trouble. I had met a boy unlike any guy I'd ever met before and he had a girlfriend. Over the next week, Mr. Narwhal and I messaged each other back and forth a lot. It was magnetic. As we got to know one another things started to feel a little crazy. The conversations consisted of far too many "No way! Me too! "'s to keep track of. We kept saying "This is crazy! This is nuts!" and somewhere along the way it became "Coconuts." As the first month of summer progressed, we all spent a lot of time together. I went from trying to force myself to swallow my feelings for the guy with the girlfriend to knowing he was the guy I was going to marry. I just knew in my gut that he was the one and about three weeks after we met I opened the can of worms. I had to know if I was crazy and feeling this one-sided or if he was feeling it too. Everything had been friendly between us; however, I just knew I had to say something. It was stressful feeling this way about someone in a relationship, since I so wasn't that girl to break up a relationship. The feelings were nothing I had ever experienced before. His response was that we were definitely riding in the same boat. After we established that our friendship had more meaning, something had to change before it got into the territory of being disrespectful and wrong. While Mr. Narwhal had certainly developed some sort of feelings for me along the way, he respectfully kept space to sort out his own breakup and figure out what those feelings meant to him. Meeting wasn't something we planned, and he had to figure out what to do about his relationship. She was moving overseas at the end of summer, and he was supposed to move over there in the winter. He was filled with doubts about moving when we met and as soon as he admitted he didn't want to move, things started to unravel. It became clear to them both that they wanted very different things. So, a little over a month after we met, Mr. Narwhal mutually ended things with his girlfriend. By the end of August 2012, we were inseparable. At the end of February 2013, we moved into together. 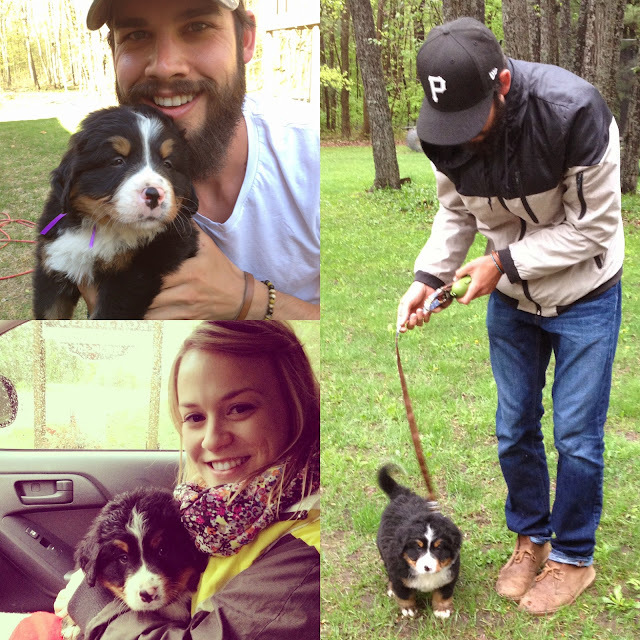 In May 2013, we brought our puppy Nelson home and in December 2013 we purchased our first home. Things initially moved pretty quickly, but from that first smile on that Sunday morning, we knew. Did you have a less than typical start to your relationship?